I am DEAD, and all the jumpy claps in the world are not enough to revive me. La Reina was on fiiiiine form this evening. 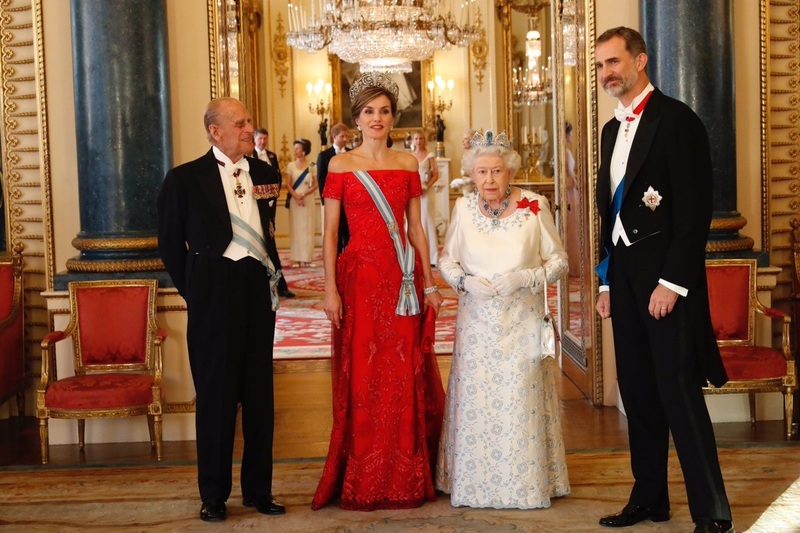 She delivered on every front: a stunning and sparkly red gown from Felipe Varela which will surely enter my royal sartorial hall of fame, plus a selection of serious jewels. The gown was absolutely magnificent in motion, the caped skirt dramatically flowing and the embroidery sparkling like magic. The width of the skirt is a nice balance, volume-wise, for the Fleur de Lys Tiara. She also wore the earrings and one of the bracelets from the joyas de pasar. Sash check: Spain’s Order of Charles III for Letizia as well as for Philip and Charles. It’s not surprising that Letizia did not receive a British order; it’s rare that a consort receives one, and Queen Sofia never did. She’s wearing it tucked into her dress, which is not unusual – it’s been done by other Spanish royal ladies, and by other royals too. Some etiquette guides say you shouldn’t have the sash touch your bare shoulder (though there are many many examples of queens wearing sashes with strapless gowns, so it varies). I also imagine it’s just more secure in place like this. Our biggest sash check comes for Felipe, because he was awarded the Order of the Garter, the highest honor QEII gives to other monarchs. Juan Carlos did not receive this until a return state visit and father and son both now have it, so this is special. 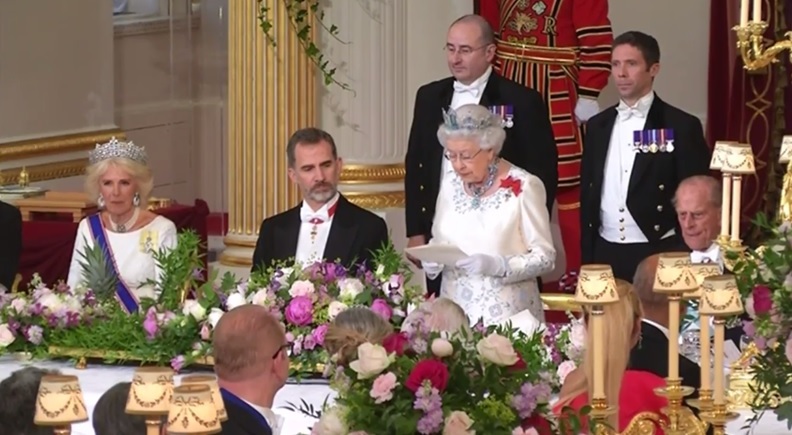 Felipe also wears Spain’s Order of the Golden Fleece around his neck. 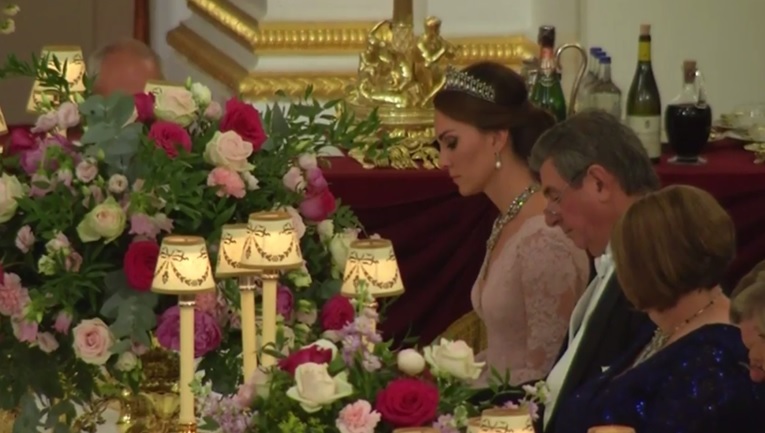 Kate sported a blush pink Marchesa gown with a sleeve that would make Queen Máxima proud. It is…okay. But I don’t have time for the gown, because THE JEWELS. 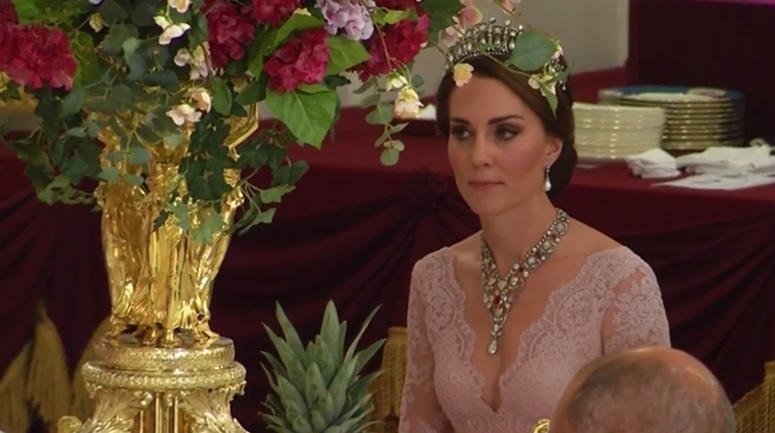 She wore the Cambridge Lover’s Knot Tiara, as she has done in the past, with two new additions to her gem repertoire: the Ruby and Diamond Floral Bandeau Necklace on loan from the Queen and the Collingwood Pearl and Diamond Earrings. The necklace (referred to today as King George VI & Queen Elizabeth Bandeau Necklace by the palace) was a part of the Greville Bequest and was among the Queen’s wedding gifts; I've written about it here. The Queen hasn’t worn it since the 1980s and it’s too long for her current necklines, so this is fabulous to see in use again. The earrings may be even more significant. These earrings were a wedding gift to Diana, Princess of Wales, from Collingwood Jewellers; she wore them often with this tiara. I hope this is the first step to seeing more of Diana’s private collection emerge. Plus, these are a MUCH better fit with that tiara! A match made in heaven. Sash check (well, order check): Nope, she does not have the Queen’s Royal Family Order yet. I know that people like to draw conclusions about her relationship with the Queen from that fact, and I reserve the deepest of eye rolls for that kind of thing. The Queen doesn’t award things lightly and all the rest of the ladies that have it are “full time royals”, basically. I consider it as simple as that. Did anyone guess the Brazilian Aquamarine Parure would be QEII’s pick for the night? Not me! It was just an aquamarine night, I guess, because Anne joined in with her Aquamarine Pineflower Tiara and Sophie wore her Wessex Aquamarine Necklace Tiara. And, sadly, a few quick glimpses of them during the speeches is about all we’ll get. 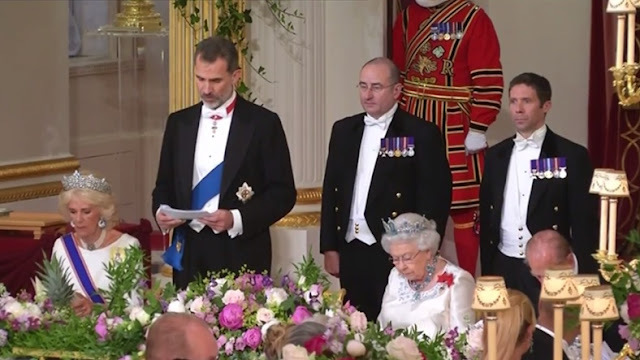 Sash check: The Queen wears Spain’s Order of the Golden Fleece on the bow on her shoulder. It was given to her by King Juan Carlos. 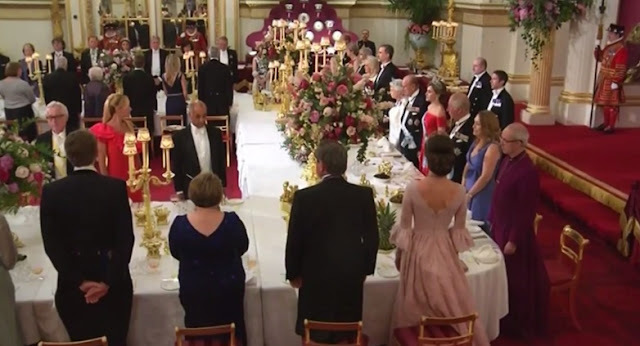 British orders for the rest, the Order of the Garter for Anne and the Royal Victorian Order for Sophie and the Royal Family Order brooch for them both. 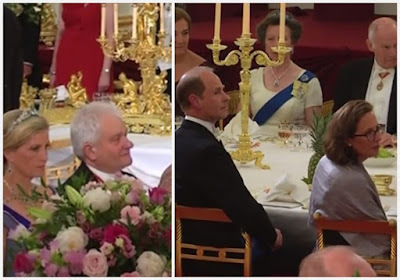 A repeated white dress + a pearl choker + the Greville Tiara = Camilla’s uniform. She’s saved from boredom here (you know, as much as one can be “bored” with this many diamonds) by a serious pair of sparkly earrings which are new! They are pricey little numbers from Van Cleef & Arpels, here's more information. Sash check: No Spanish order for Camilla (again, not surprising; Diana didn’t get one in the 1980s either), so it’s her Royal Victorian Order with the Royal Family Order brooch. Making his state banquet debut…hi, Harry! His order check shows us his Royal Victorian Order around the neck (he’s a lower grade than Sophie and Camilla, so he doesn’t have the sash). He also appears to be wearing two breast stars on his jacket, one for the RVO and one for...something else, hard to see. 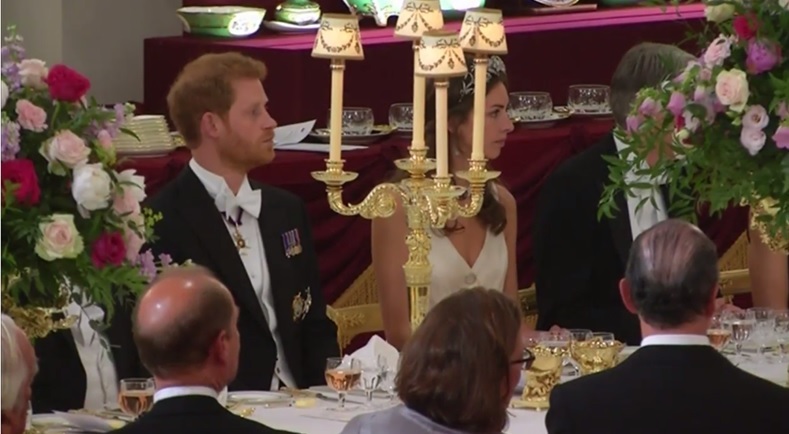 And his tiara-wearing seatmate is the Marchioness of Cholmondeley, because I know that gem will catch some eyes. Princess Michael is one of those royals that attends plenty of state banquets but isn't often seen. I'm so glad she was on this occasion, because I always need to see the Kent Festoon Tiara. This state banquet was also a first for Princess Michael's daughter, Lady Gabriella Windsor, who I believe is just out of this picture. What makes your best list from tonight’s banquet? Phew! What a delight! 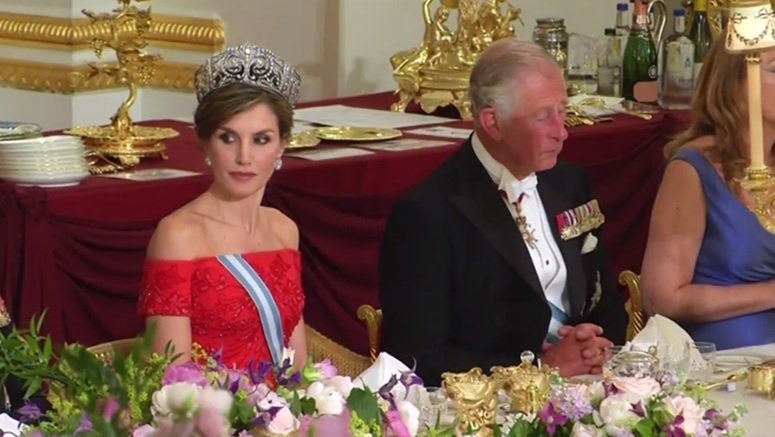 And guess what...there's still a Guildhall banquet with a second tiara opportunity for Letizia tomorrow night.